Where Do Petunias Originate From? Do Petunias Thrive in Shade? Petunias grow either as a ground cover or as individual plants. They grow well in flower boxes, hanging baskets, flower beds and many other containers. Some have a few large blooms while others have many smaller blooms; some have single-petaled and some have double-petaled flowers. This plant grows as an annual, so in order to keep them around next year you must collect the seeds. Knowledge of how to do this will give you numerous seeds for next year. Let some of the flowers die on the stem instead of deadheading them back. Watch them as they become dried and brittle. Pinch the faded blooms behind the base of the flower right after they dry completely but before the seed pods split open. Be careful as you pinch them off as they may burst open with handling. Split the pods open if they aren't split already. Shake out the seeds into a paper bag. Fold the top of the paper bag down to keep the seeds safe inside. Store the bagged seeds in a cool, dry area. Replant the seeds indoors 10 to 12 weeks before the last frost date. Check the petunia flowers daily for signs of wilting or drooping petals. Be prepared to collect the seeds as soon as the blooms begin to fade. Place a small cloth bag over the top of the flower head once the petals begin withering. Use a small cotton bag or the tulle bags that are sold for party favors. Secure the bag to the flower stem with a paper clip. Check the seed pod daily once the cloth bag is on it. Cut the flower stem off once the seed pod begins to split and release seeds. Remove the bag, taking care not to spill any seeds. Hold the pod over the bag and finish splitting it open, shaking out the remaining seeds. Mark an envelope with the petunia variety and year harvested. Place the seeds inside; then store the envelope in a cool, dry place until it is time to replant the seeds. There are four varieties of petunias. The first, grandflora petunias, produce large flowers that make them best suited for hanging pots or window containers. Multiflora petunias are smaller, but offer an abundance of blossoms. Miniflora petunias present petite flowers that are best suited for mixing with other annuals in one container. Groundcover petunias are the perfect addition for spreading down a hillside garden or sprucing up a retaining wall. When planting your petunias, sprinkle a timed-release fertilizer into the soil and space the plants 12 inches apart. Plant in full sun or an area where they will receive at least six hours of sun a day. Petunias are fairly tolerant of heat, and watering once a week should be sufficient. Drench the soil about 6 inches down. Plants in pots and groundcover petunias require more frequent watering, every two or three days. Petunias will repeat bloom throughout the summer. Frequent deadheading--pinching off fading blooms--and pruning back leggy stems are essential to resetting flower buds. Petunias generally have few problems. Some things to look out for: gray mold and soft rot in rainy areas; aphids, which can be hosed off with a blast of water, and caterpillars, which will leave small holes in the leaves and petals. Plant your double petunias 12 inches apart in an area that receives at least six hours of sunlight a day. Although they will grow in the shade, they will not flower as profusely as they will in the sunshine. Double petunias are especially in need of long days to bloom. Amend the soil in the planting area by adding a 3-inch layer of compost or well-rotted manure. Using the gardening fork, mix the amendment in with the existing soil to a depth of 8 inches. Add fertilizer to the soil. Extension agents at the University of Minnesota suggest 12-12-12 at a rate of 2 pounds per 100 square feet. Mix this in with the amended soil. 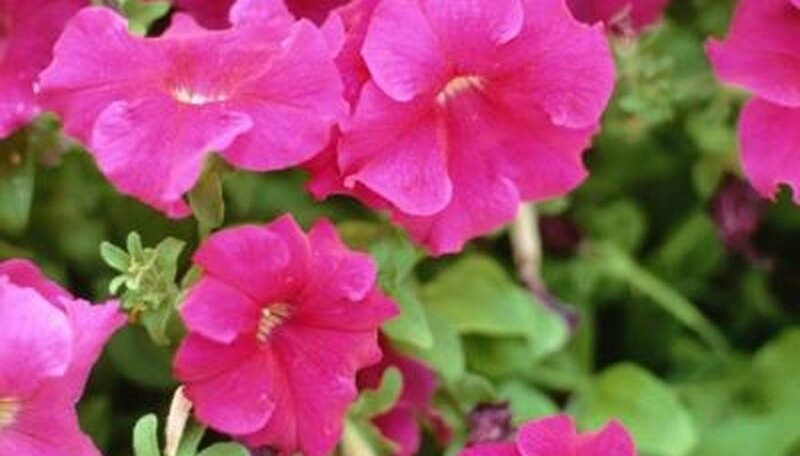 Once the double petunias are established, starting in early July, use liquid fertilizer every two weeks, after watering. Water the double petunias once a week, making sure the soil is wet to a depth of 6 inches. If you are growing your flowers in pots or containers you may need to water more frequently. Look over your seeds to make sure they are fully dry. If not, spread them out on a paper towel and leave in a room with low humidity for a few days. Label a plastic bag with the type of seeds, the color of the blooms and the date you collected the seeds. Place your dried seeds into the plastic bag, press out any excess air and seal the bag well. If you have them available, you can place a silica gel packet inside the bag. Store the bag in a dark, cool, dry place, such as a closet or seed box for anywhere from 3 to 4 years. Increase your storage time and viability to 5 years by placing the plastic bag of seeds into a refrigerator. Pinch each stem of the plant back to around 4 inches when you first plant it. This will encourage the stems to sprout flowering side shoots lower on the plant and create a fuller, bushier form. Grasp a stem between your forefinger and thumb. Apply firm pressure while bending the stem slightly until it separates. Remove dead and faded flowers by pinching them back to the stem. This procedure, often referred to as deadheading, will prevent the petunia from going to seed and encourage it to bloom further. Pinch each stem to around 4 inches long once the first blooming has completely finished. This will rejuvenate the plant and encourage the stems to branch and bloom again in a few weeks. Inspect the petunias for dead, fading or drooping blooms. Snip off the blossoms below the wide green portion that holds the flower to the stem. Repeat deadheading the petunia until you remove all of the dead and decaying blossoms. Deadhead petunias as blooms droop. Once the plants seed, they will propagate for the next season. If you never let the plant get to the seeding stage, you will prolong the bloom time and force the plant to expend its energy on more and more blooms. Deadhead by pinching at the base of the bloom and pulling gently until the flower releases. Fertilize regularly using a balanced ratio fertilizer through the whole season. Prune in mid-summer once shoots get long and stringy-looking. New growth will come in bushier and produce a new round of first blooms. Use sharp scissors or gardening shears to prune with one quick snip about 1 to 2 inches from the base of the plant. Water and fertilize immediately after pruning. Plant wave petunias in different soil each year. Plant them in a different spot in the ground, or for containers and hanging baskets, change the soil annually. Yellowed leaves usually indicate a need for nutrients. Apply a soluble fertilizer up to twice a week for container plants, of weekly for in-ground plants, and keep the plants watered. Do not allow the soil to dry out. Small chewing insects or caterpillars are the most common insect pests. Use an organic insecticide such as Bacillus thuringiensis (Bt) or diatomaceous earth following package instructions. The mysterious disappearance of your wave petunia flowers may be due to rabbits. Dust the plants with cayenne pepper powder to repel them. Late season growth may become long and "stringy". Prune off a few inches from the tips of the long strands, and fertilize twice weekly. Bushier growth should appear in 10 to 14 days. Watch the flowers for any swelling at the base. These should develop into seed pods if the flower was pollinated. Pick the seed pod after it is browned and dry but before it splits open. Place a container under the seed pod, and snip the dried pod with a pair of scissors so it falls into the container. The seeds are very tiny and easily will blow away, so collect them carefully. The Superbells do not produce very many seeds, so you might have to look awhile to find them. Bring the collected seed pods indoors and pour them onto a piece of paper. Crush the seed pods between your fingers to remove the little black seeds. Clean out the large pieces of debris. Fold the paper in half carefully, without spilling the seeds. Pour the seeds into the small recloseable bag, tapping the paper to move all the seeds down. Close the bag, and store the seeds in a cool and dark place until the next growing season. Petunias originate from South America. The common garden petunia (Petunia x hybrida) is a result of crosses between "Petunia axillaris," "Petunia inflata" and "Petunia violaceae," all of which are native petunias of regions of South America. Plant petunias in well-drained soil. Do not use moisture-retaining potting soil, as this leads to root rot. Water the petunia when the top inch of soil feels dry to the touch. Petunias are drought-tolerant and prefer their soil to be on the dry side. Fertilize every two weeks with a balanced, water-soluble fertilizer. 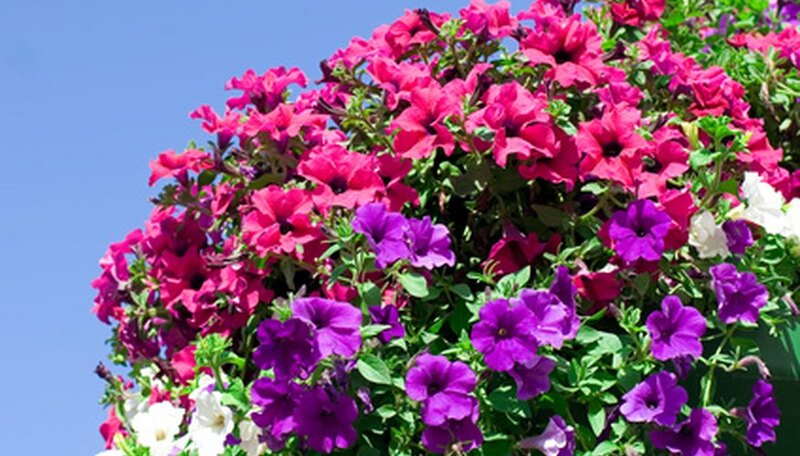 The best concentrations for petunias are 8-8-8, 10-10-10 and 12-12-12. Keep the plant in full sunlight for at least 6 hours each day. In the south, reduce the light to filtered light or fewer full-sun hours because of the scorching temperatures. Move the petunia indoors when the weather drops to 60 degrees F during the day. Petunias do not like cool weather, and will wither when exposed to the cold for too long. Provide light indoors with a bright, sunlit window that receives at least 8 hours of sunlight each day. Alternately, if there are no brightly-lit windows, use a grow light or bright, unshaded lamp. Like many annual bedding plants, petunias thrive with lots of sun. At least six hours per day is preferable. The plants grows in light shade, but as a rule, the number of flowers is directly related to the amount of sunlight the plant receives. Along with abundant sunshine, petunias need well-drained soil. In areas with clay soil, this requires amendment with organic material like compost or peat moss. Once established, the plants are fairly drought tolerant. Feed with balanced fertilizer about every three weeks during the growing season. Petunias generally fall into one of four groups. Grandifloras feature large flowers and a mounding habit. Multifloras have smaller, more abundant flowers. Millifloras sport the smallest flowers of all and work well in containers. Ground-cover petunias spread rapidly and can cover large areas or cascade from hanging baskets.